Not only is data an asset to your organization, but so are the people who manage it. Equipping your data scientists with the right combination of course content and instructors is important to enhance their overall learning experience. What makes their education even more impactful, is the ability for them to learn from real world examples, including their own data. Utopia’s SAP® Data Services software training offers all of the above, plus two courses on data integration and quality. These classes focus on the use of SAP Data Services solutions along with complementary courses. Participants will be able to build their skill sets and extract greater value from your data integration. The courses are delivered by Utopia instructors who are experts with SAP Data Services software. Classes can be conducted either on-site at your facility or at Utopia Labs™. The courses provided are BOI300 for data integration using SAP Data Services and BOQ300 which is a combination of data integration training enhanced with data quality concepts. Each course is delivered per the defined guidelines set forth by SAP for BOI300 and BOQ300. Adhering to SAP standards not only ensures uniform training delivery, but that all functions of SAP Data Services are covered per the software manufacturer’s guidelines. The Utopia advantage of these private classes is the ability for them to be augmented with custom content and the ability to utilize your own data. 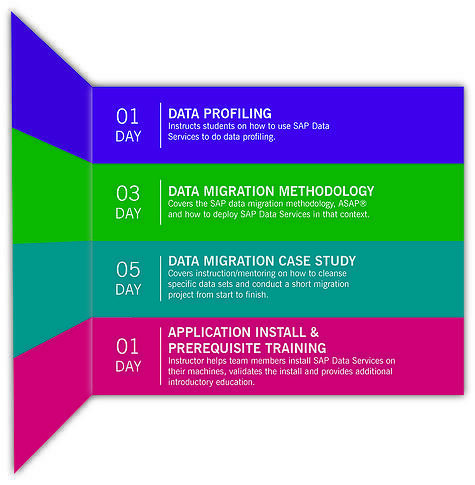 In addition, four add-on course modules exist to enhance the training and prepare your data integration and migration staff for complex projects. To extend the learning process, Utopia instructors can work with you to create course material above and beyond the two core classes and four add-on modules.